Undercover detectives, secret agents and fugitives aren't the only people who need to conceal their identities. A successful disguise de-emphasizes the things that make you stand out and helps you blend in with the people around you. Although advanced makeup techniques can be useful, the basics of creating a disguise are very simple. Before you start creating your disguise, identify the features you most want to conceal. Ask yourself how you would describe your appearance in a sentence or two. Any feature that crops up in that description -- whether hair, nose, eyes, build or clothing -- is a prime target for changing. Make a short list of these key points. Once you have your list of features to conceal, take stock of the resources at your disposal. Items of clothing such as hats, glasses and coats are very useful, as well as all the makeup supplies you can lay your hands on. In addition to these, accessories such as walking sticks, bags, cotton wool and even small stones can be useful. 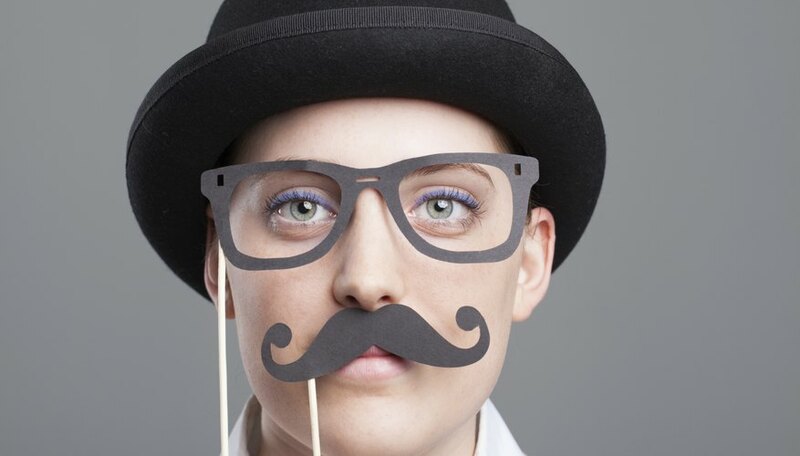 Any good disguise starts with changes to your personal appearance. Consider the elements of your look you can change. If you have facial hair, consider shaving it off; if your hair is long, cut it shorter or at least change the style. Dyeing your hair is another simple way to change your appearance. If you have a long time to create your disguise, growing a beard or mustache can make a big difference to your appearance. You should also try to vary your posture; slouching or straightening can help vary your height. To simulate a limp, conceal a small stone in your shoe. Change the shape of your face by concealing pieces of cotton wool between your gum and cheek or behind your bottom or top lips. If you wear makeup -- or even if you don't -- change your foundation in order to darken or lighten your skin. Changing your clothes can make a dramatic difference to your appearance. Vary your outfit as much as possible from the norm. If you wear glasses, consider contacts; if you're usually in flowing skirts, switch to jeans. Wearing heels -- or flats if you normally wear heels -- can help confuse observers about your height. Take the environment into account when planning your disguise; a long overcoat conceals a lot, but it's not appropriate for a hot day, while sunglasses in winter will stand out in a crowd. If you have some experience with stage makeup, you can make even more drastic changes to your appearance. Use flexible stage putty to lengthen your nose or build up your cheeks or chin. Attach this malleable substance to your face with spirit gum and cover the joins with makeup.